This time, the women had much smaller purses. The majority of the points (150) were earned by Mr. Handsome’s grandmother (Gram) and oldest sister (Anne). In addition to the Purse Raid game, we also held a bridal pumpkin decorating contest (photo coming soon). 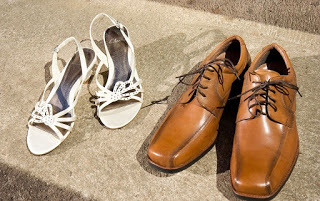 When the groom-to-be arrived at the end of the shower, I led him and his bride in the Couples Q&A Shoe Game. Surprisingly, their responses were identical for all but three of the questions! Have the bride and groom sit in chairs so they are facing opposite directions. 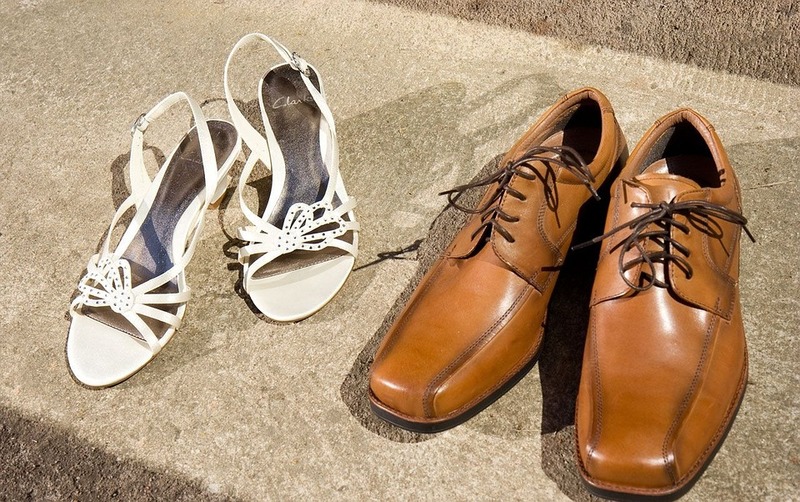 Ask both of them to remove their shoes and exchange one of their shoes with the other person, so each of them is holding their shoe in one hand and the other person’s shoe in the other hand. -Who is the pickier eater? -Who chose the honeymoon location? -Who is afraid of heights? -Who is the morning person? -Who is a night owl? -Who is more likely to leave clothes all over the bedroom floor? -Who is a better secret keeper? -Who is more likely to burn the house down while cooking? -Who is more of a dog person? -Who spends a longer amount of time getting ready for an evening out? -Who is more likely to overspend while shopping? -Who has the craziest family? -Who is the party animal? -Who is more likely to get a speeding ticket? -Who is more likely to fall asleep in front of the TV? -Who is a more trustworthy driver? -Who will manage the finances/spending? -Who is more likely to lose something? -Who will mow the lawn? -Who has better organizational skills? I like to eat and watch the person open their gifts but I don't like to play those shower games. Does anyone else feel the same way or am I the only one. I'm with you. I don't enjoy the games either. It's nice to know someone else feels the same way. Another great game that doesn't require any set up! That's exactly what I was thinking when I chose it! LOL. my brother and sil did this at their wedding reception. It's how the announce to everyone they were expecting their first child. The bridal party and parents new but no one else. It was fun, everyone was looking around confused cause the question was who is due at the end of December 2013. What r u and Mr Hansomes answers to those questions? Thanks for the idea, Elle! I'll definitely suggest this for an upcoming baby shower next month for our friends from Church. Wow impressive that they only answered 3 of the questions differently. If you don't mind sharing which questions were they? Also if you wouldn't mind sharing what are your and Mr handsome's responses to these same questions? I know, we were very impressed! Hmm, let me think. He said he had the craziest family, and she said she had the craziest family. Then I think they each said the other person was a better secret keeper. (Aww) They also didn't have the same answers for "Who's more likely to lose something," but I can't remember what they said. I don't know how my husband and I could answer those questions. The correct person could change weekly, and in some cases, it's both of us or neither! Can you hold up 2 shoes, or none? We did this at our wedding reception. We did pretty good! But we had been together for 7 years when we got married, so we knew each other very well. It is a fun game, and we had a great time playing it! Playing it at a wedding reception would be fun! Did you have a large wedding, or did you keep it small?